Sound is invisible vibrations travelling in all directions through the air described as ‘sound waves’. The range of different soundwaves in any given environment is a ‘soundscape’. Sound waves are can be generated in our voice box and projected from our mouths, enabling us to talk and sing. Devices such as speakers and musical instruments are similarly designed to generate sound waves. Sound waves are also generated by elements and objects interacting in the environment around us (e.g. waves crashing on rocks, boots crunching on gravel, car tyres screeching on the road, wind blowing through trees, etc). Almost all sound waves are unique, reflecting the vast range of different sounds. Sound waves vary in frequency, amplitude, pressure/intensity, speed and direction. 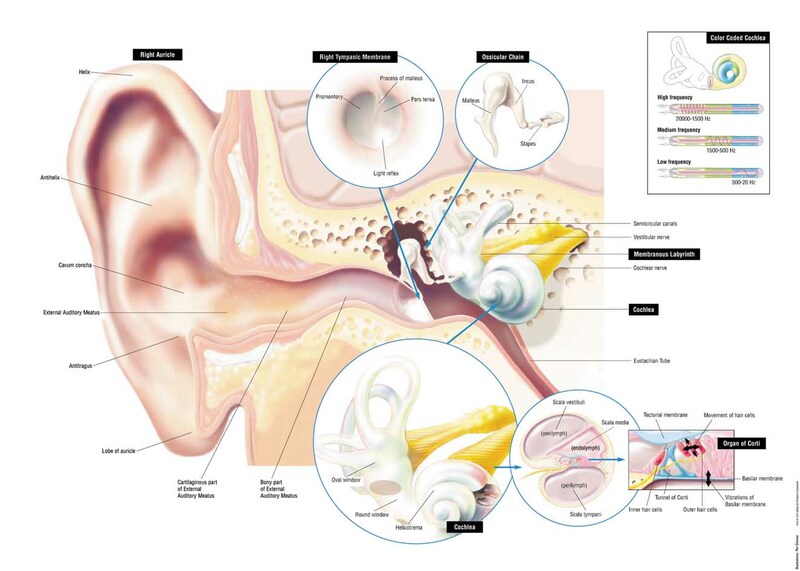 Our ears are a highly complex system of canals, bones, hairs, nerves and cells which enable us to receive and process soundwaves. The electrical signals are then sent to the brain via the hearing nerve and our brain interprets them as a type of sound. How we understand and perceive sound (>> link to new “How we process sound” page) is a function of the brain. This incredible system operates instantaneously and can process multiple soundwaves at once.